The internet is a great resource that the millennial generation has been able to use more than previous generations. While the internet is great for browsing Facebook or Twitter, it can also be an awesome tool for your next job search. 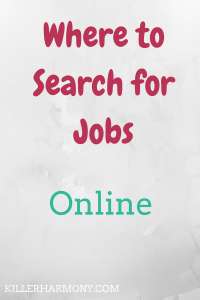 There are many websites online that allow you to search for jobs, and you can also use social media to find job leads. This post will cover some of the different job search sites as well as different job groups on social media. I am only going to cover free resources for finding jobs, you probably can’t afford to spend money. That’s why you need a job, right? Indeed is a pretty big website that you can use to search for jobs. You can search for different keywords and job titles as well as location. They also have an option for advanced search. The advanced job search allows you to specify what words you want to see in job listings, specific titles, company, job type and even salary estimates. Once you start looking at jobs on the site, it will track your search history. You can find recommended jobs and go back to old searches that you want to look at more. Indeed also allows you to subscribe to email updates from different jobs you search for. You can also create an account and upload your resume to make applying to jobs easier, or you can upload your resume each time you fill out a job application. CareerBuilder is another standard job search platform. It shows jobs in multiple different industries. Like with Indeed, you can search for jobs based on their title, city or company. CareerBuilder even lets you search for jobs based on different categories. You can make an account and upload your resume so that employers can find you for jobs. There are tons of talent networks that you can join to help further your career and find jobs. The site also has a ton of resource that you can use to explore careers. If you can’t find what you are looking for on the more generic job search sites, you can check jobs boards for your industry. Since I want to work in the blogging and digital media field, I like to periodically check blogging boards. The ProBlogger and BloggingPro job boards post good job leads, and little, if any, spam. You can search for keywords and different job types, and you can also add your location (or search for remote jobs). Look for job boards in your industry by searching “[insert industry/major here] job boards” on Google and see what comes up. You never know what you might find. If you want to get into freelancing, Facebook groups in your field can be a great way to find job leads. If you want a writing job, look for writing and blogging groups. You can also look for groups where your target client would be. Want to work as a health coach? Find groups for healthy living. Facebook groups are a great way to meet people in your industry and make connections. Depending in your niche, you might not get jobs directly from Facebook. However, the connections you make can lead to recommendations down the road. LinkedIn is sometimes called something like “the Facebook for job seekers.” While I don’t have much experience with LinkedIn, it does seem to be a great resource. New job leads show up regularly in your feed, and you can add your education and employment background to your profile. You can also form connections with people and companies in your niche. That way, you can learn about your industry by reading their posts and also get better job recommendations. I had to include good old Google on this list, because you really can’t go wrong. If you can’t seem to find any jobs that interest you, why not use Google to search for them. You can search for jobs in your industry or even for a specific company. It’s like a big mix of different jobs from job boards and company websites. While it is not the best first choice, it can be a good place to go when you feel like you are out of options. So, have you started looking for jobs? What tools did you use? What advice do you have for job seekers? Let me know in the comments. Be sure to check out this post on job searching and follow me on Twitter (@HannahHaefele) so you don’t miss future posts!